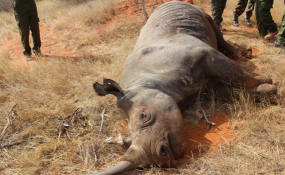 Nairobi — Tourism and Wildlife Cabinet Secretary Najib Balala has suspended six Kenya Wildlife Service (KWS) officers over negligence following the deaths of 10 out of eleven rhinos translocated to the Tsavo East National Park in June. Among those suspended on Thursday is the service's Deputy Director in-charge of Biodiversity, Research and Monitoring, Samuel Kasiki, who according to a report tabled by a six-member probe team failed to coordinate research-line departments at the KWS leading to poor decision-making. "He did not coordinate line departments and provide best advice on best science on the management of the translocation exercise failed to play his role as expected," Balala announced during a media briefing Thursday when he released the findings of an inquest into the deaths of the rhinos. The drilling company was reported to have advised the park management to undertake continuous pumping so as to monitor the salinity levels in the two boreholes ahead of the relocation of the rhinos - eight from the Nairobi National Park and six from the Nakuru National Park - advice KWS officers managing the translocation overlooked. "The independent inquiry shows that there were areas of clear negligence that occurred at the Tsavo which include poor conditioning, poor coordination, and poor communication by KWS staff at the Tsavo," Balala disclosed. Balala also reorganized KWS's management reverting Acting Director General Julius Kimani to his former position of Director of Parks and Reserves with Charles Musyoki set to take over as Director General on an acting capacity. According to the independent inquiry team by led by Benson Omondi, an officer from the Directorate of Criminal Investigations, the 10 rhinos died due to Multiple Stress Syndrome fueled by the uptake of saline water at the park. The inquest also reported "starvation, proliferation of opportunistic bacteria in upper respiratory tract (Pasteurella species), gastric ulcers and gastritis" as triggers of the deaths.